Indianapolis has a rich and interesting history. The city was founded in 1816 when Indiana became a state. It was selected because of its central location. The city was founded on the White River because planners anticipated that it would provide transportation. As it turned out, the White River was too sandy to be of much assistance. Nearly 200 years later, the city has grown to be the 13th largest in the country. You probably know a bit about its history, but here are a few things about Naptown that you might not know! What's better than sliced bread? The city that birthed it! Wonder Bread of Indianapolis was the first to publicly market sliced bread. The Slippery Noodle Inn is one of the oldest bars in Indiana and has a rich history which includes being used as target practice for John Dillinger and his gang. It was a stop on the Underground Railroad and it's even rumored to be haunted by some of the shady characters of its past when it hosted a brothel. The Indianapolis Motor Speedway is the largest sporting facility in the world. It covers 253 acres and holds over 250,000 seats. The Roman Colosseum and Vatican City, Churchill Downs Churchill Downs, Yankee Stadium and the Rose Bowl could all fit in the inside oval of the track. Crown Hill Cemetery is the third largest cemetery in the country. 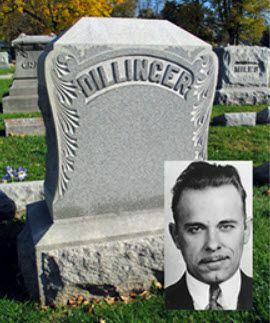 John Dillinger, Robert Irsay, Col. Eli Lilly, President Benjamin Harrison, James Whitcomb Riley and Booth Tarkington are all buried there. The cemetery hosts walking tours that highlights the graves of notable people. Indianapolis is the second largest populated state capital. The honor of the most populated state capital in the country is Phoenix, Arizona. John Andretti, Joyce DeWitt, Kenneth "Babyface" Edmonds, Mike Epps, Vivica A. Fox, Brendan Fraser, Benjamin Harrison, David Letterman, Eli Lilly, Steve McQueen, Ryan Murphy, Dan Quayle, James Whitcomb Riley, Kurt Vonnegut, Ryan White and Keke Wyatt are all from Indianapolis, just to name a few. The Chase Tower is the tallest building in Indianapolis and the entire state. It is 48 stories tall and stands over 830 feet. Indianapolis native, Albert Von Tilzer wrote, "Take Me Out To The Ball Game”. Lucas Oil Stadium is the largest NFL stadium in the country. It takes only eight minutes for it's retractable roof to open completely.